The apartments are located in a prime, central location in the historic center of the town of Boppard, the “pearl on the Rhine”. 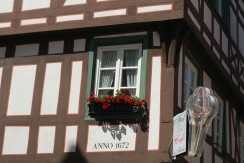 The well-preserved half-timbered house is one of the best preserved, historic houses in Boppard. The apartments are conveniently located just a few meters from the famous Rhine promenade. After only 5 minutes walk you can reach a car park where you can leave your car for free. Minimum 5 overnight stays. The family Collato is a former entrepreneurial family who now enjoys welcoming guests from around the world to stay at one of their lovingly furnished holiday apartments in the historic center of Boppard. Liliana Collato takes care of the holiday apartments with great attention to detail and great warmth and makes her guests quickly feel at home. 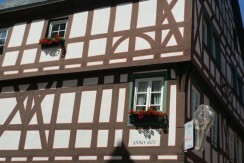 She also provides valuable insider tips for Boppard and the surrounding area. Dear visitors please be informed that we are closed in 2018. Lieber Besucher, bitte beachten Sie, dass unsere Ferienwohnungen in 2018 nicht gebucht werden können. Vielen Dank für Ihr Verständnis.